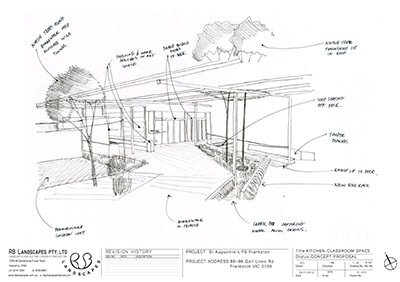 Richard Bellemo and the RB Landscapes team have been busy collaborating with St Augustine’s primary school in Frankston South. 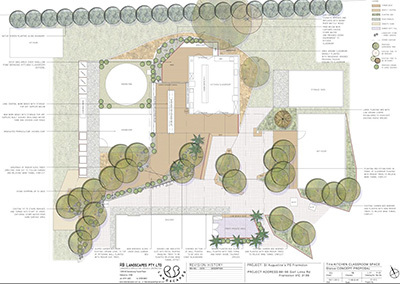 The school wishes to transform the existing open space to become more legible and emphasis their already flourishing curriculum surrounding an existing produce garden. 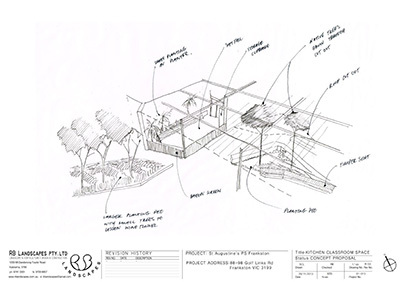 Stage one of the concept design focuses on an existing undercover space which the school wish to use in a more productive manner. 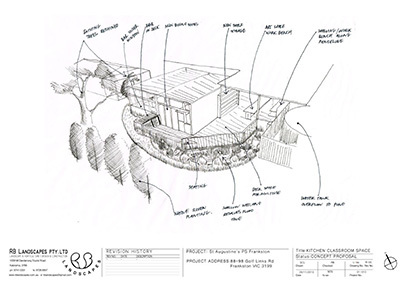 Harbouring an outdoor art room, kitchen classroom and permaculture area, the existing roof structure will be transformed to reduce its wind-tunnelling effect, improving its ability to accommodate current programs whilst maintaining its function as an all weather structure. The team will begin construction later this year.